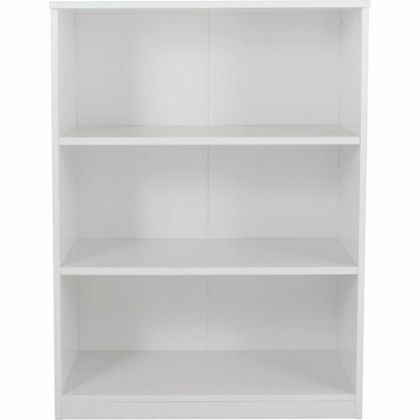 Last year, whilst visiting the Emporium (a local second hand antique and furniture store) I purchased a white bookcase, it wasn't in the fittest of states, nor was it the whitest of whites, but it was a bookcase and it was white, something I'd been looking for, for some time. Seeing the price tag of just £10, I purchased it and took it home with me. 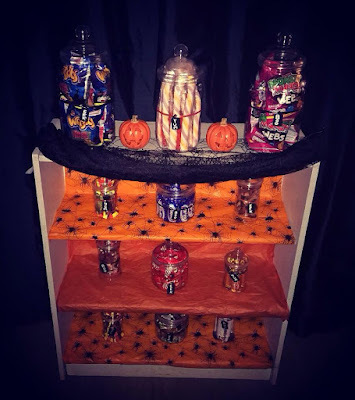 With that very bookcase, some plastic jars, candy, tissue paper and decorations, I was able to make a Halloween candy stand, and I'm going to show you just how I done it! Step One: Buy a Book Stand, or Use One You Already Own! 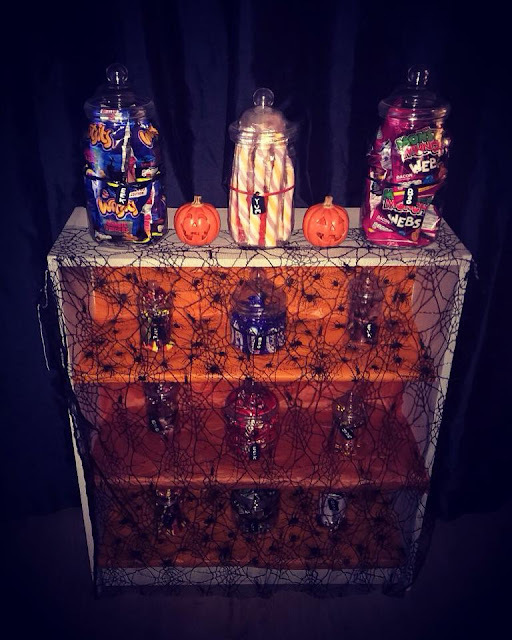 You don't need your bookcase to be a specific size, if you have a large bookcase and don't want to fill it with so much candy, you can use decorations to fill the spaces instead. Step Two: Buy Halloween Themed Tissue Paper! I purchased some Halloween themed tissue paper from a local discount store! most of them had different varieties, but I ended up getting some that contained plain black, plain orange, and orange with black spiders printed on it. Then you simply Blu-Tack the tissue paper to the shelves inside! I luckily didn't have to cut my down to size, it was literally the perfect size! I used Blu-Tack to stick the tissue paper down, just because I think it will be the most friendliest, as sellotape may damage the shelves, and super glue will keep the tissue paper there forever - or for at least a long time, potentially damaging your bookcase! I purchased plastic candy jars, not only because of Spud, and my nephews, but because of my butter fingers too! From afar and even up close, you can't tell the jars are plastic! I purchased 15 sweet jars from Keep It Sweet, with prices starting at just 89p, they was the cheapest and pretties I found! The detail on the lids make them look like actual sweet jars, from the old fashioned sweet shops! x3 380ml Victorian Sweet Jar - 89p each - £2.67 total. x3 500ml Victorian Sweet Jar - 99p each - £2.97 total. x3 1litre Plastic Jar with Bobble Lid - £1.65 each - £4.95 total. 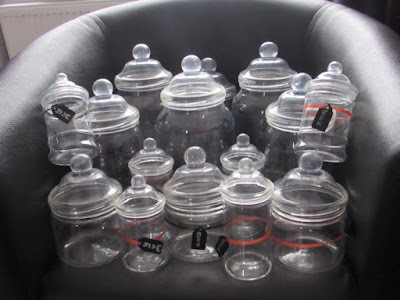 x3 2litre Plastic Jar with Bobble Lid - £1.75 each - £5.25 total. x3 3litre Plastic Jar with Bobble Lid - £1.95 each - £5.85 total. Step Four: Decorate Your Jars with Ribbon and Tags - Optional Of Course! As I said mentioned above, decorating your jars are optional! 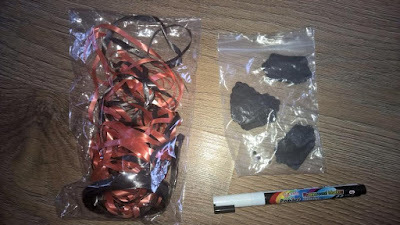 I wanted to decorate them, so I purchased orange and black ribbon to tie in with Halloween colours, black tags and a white marker pen to write on the tags! I purchased all three items from eBay via various sellers! I wrote Boo on four tags, Yum on another four tags, and Eek on another four tags, using three words with a Halloween and candy theme! Step Five: Fill Your Jars! I filled my large jars with marshmallows and crisp, the crisp are limited edition Wotsits (Zombie Fingers) and Monster Munch (Spider Webs), both picked up from Morrisons at just £1 each! 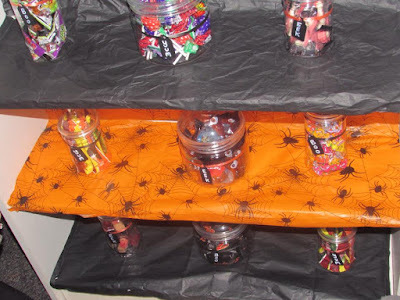 I filled the smaller jars with candy such as body parts, Maltesers, Milkyway's, Curly Wurly's, Haribo's, Fruitella etc as they're individually wrapped, but you can fill your jars with anything you like! Step Six: Accessorise Your Stand (optional). 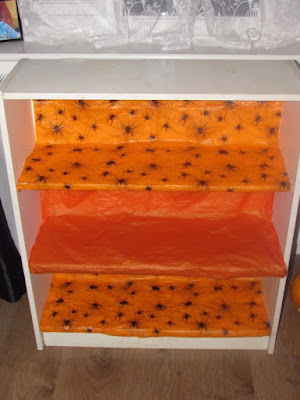 Again, this is optional, but to give it more of a Halloween feel, you can add little Halloween decorations such as plastic pumpkins, fake rats, spiders, Halloween tinsel or whatever else you want! Step Seven: Cover Your Candy Stand (optional). Again, this is another optional choice, but as I had small guest attending our press bash, I didn't want them to be feasting on sweets and other treats before the cooked savoury food! 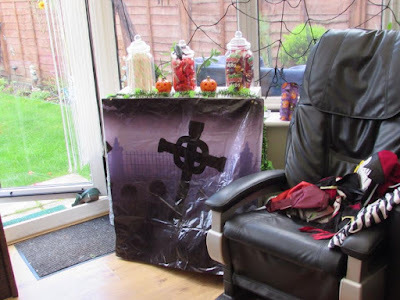 Last year I used a Halloween table cloth, and this year I used a Halloween style net curtain that didn't fit my window! FINALLY: Enjoy Your DIY Candy Stand! 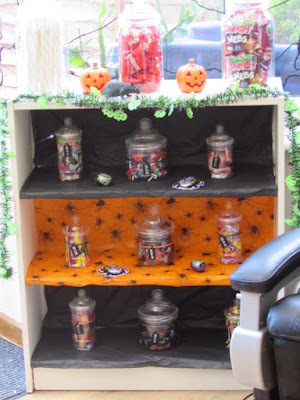 At last, your candy stand is finished and ready to show off to your Halloween guest! It doesn't cost much from start to finish, can be used year after year and for different themes too! My sister's asked to borrow my jars for her wedding, the opportunities really are endless! My finished product, which I'm actually rather proud of! It cost me just a fraction of the price that I would fork out on a candy stand to hire! It's also something made by you personally! This looks really good. The kids that will visit you must absolutely love it. This is a great idea, perfect for parties. I love the plastic jars too - where were they from?